LPS, a major component of the cell wall of Gram-negative bacteria, can induce a variety of biological responses including cytokine production from macrophages, B cell proliferation, and endotoxin shock. All of them were completely abolished in MyD88-deficient mice, indicating the essential role of MyD88 in LPS signaling. However, MyD88-deficient cells still show activation of NF-κB and mitogen-activated protein kinase cascades, although the biological significance of this activation is not clear. In this study, we have examined the effects of LPS on dendritic cells (DCs) from wild-type and several mutant mice. 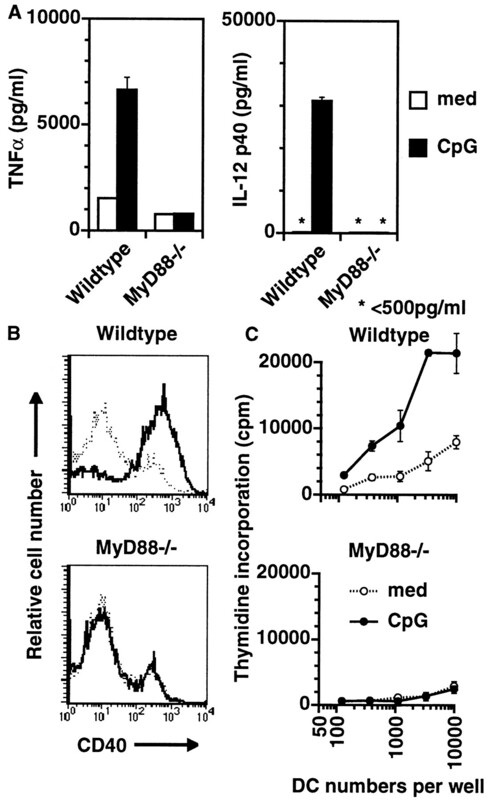 LPS-induced cytokine production from DCs was dependent on MyD88. However, LPS could induce functional maturation of MyD88-deficient DCs, including up-regulation of costimulatory molecules and enhancement of APC activity. MyD88-deficient DCs could not maturate in response to bacterial DNA, the ligand for Toll-like receptor (TLR)9, indicating that MyD88 is differentially required for TLR family signaling. MyD88-dependent and -independent pathways originate at the intracytoplasmic region of TLR4, because both cytokine induction and functional maturation were abolished in DCs from C3H/HeJ mice carrying the point mutation in the region. Finally, in vivo analysis revealed that MyD88-, but not TLR4-, deficient splenic CD11c+ DCs could up-regulate their costimulatory molecule expression in response to LPS. Collectively, the present study provides the first evidence that the MyD88-independent pathway downstrem of TLR4 can lead to functional DC maturation, which is critical for a link between innate and adaptive immunity. Bacterial cell wall components such as LPS provoke innate immune responses by stimulating macrophages to produce proinflammatory cytokines (1, 2, 3). Toll-like receptor (TLR)4,3 a member of the TLR family (4, 5), is a critical receptor and signal transducer for LPS, because LPS-mediated cytokine release was abrogated in mice with natural mutation of TLR4 or its targeted disruption (6, 7, 8, 9). TLR4 has an intracytoplasmic region, called the Toll/IL-1R homology (TIR) domain. Through the hohomophilic interaction of TIR domains, a cytoplasmic adaptor molecule, MyD88, is associated not only with cytokine receptors for IL-1 and IL-18 (10, 11, 12, 13), but also with various TLRs including TLR4 (14, 15). MyD88-deficient mice showed complete resistance to LPS responses including cytokine production from macrophages, B cell proliferation, and endotoxin shock (16, 17). Thus far, no biological responses have been observed in MyD88-deficient cells, indicating that MyD88 is an essential component in LPS signaling. However, MyD88-deficient macrophages still showed delayed activation of NF-κB and mitogen-activated protein kinase (MAPK) cascades in response to LPS (16). It remains unclear at present whether the activation is biologically significant. In addition to macrophages, dendritic cells (DCs) with highly potent APC activity function as critical sentinels in antimicrobial immune responses (18, 19). Exposure to microbial components such as LPS can induce DC maturation characterized by cytokine production, up-regulation of costimulatory molecules, and an increased ability to activate T cells (20, 21, 22). Together with macrophage activation, the DC maturation is critical for a link between innate and adaptive immunity. In this study, we have investigated the effects of LPS on DCs from wild-type and several mutant mice. MyD88-deficient DCs can respond to LPS in terms of up-regulation of costimulatory molecule expression and enhanced Ag-presenting activity. Our study for the first time demonstrates that the MyD88-independent pathway through TLR4 can lead to the innate immune response, i.e., DC maturation. C57BL/6, BALB/c, C3H/HeN, and C3H/HeJ mice were purchased from Japan SLC (Shizuoka, Japan). 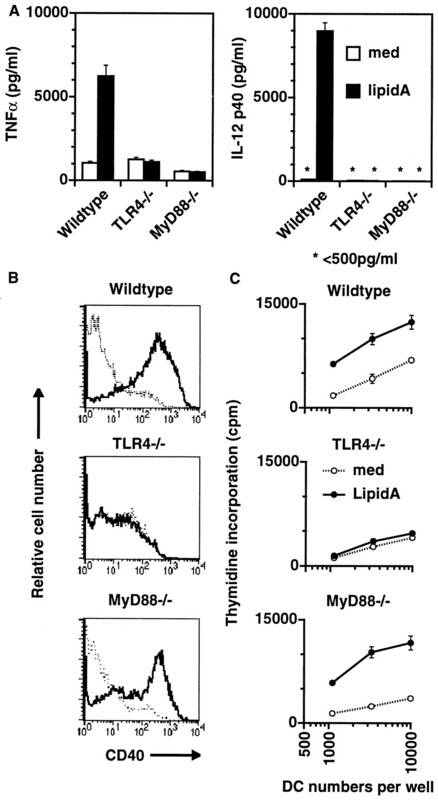 TLR4- and MyD88-deficient mice were established as described previously (8). The BALB/c-background DO11.10 TCR-transgenic mice (23), which recognize the 323–339 peptide of chicken OVA in the context of I-Ad, were kindly provided by Dr. K. M. Murphy. MyD88-deficient mice with a BALB/c background were obtained by backcrossing them to BALB/c mice for five to six generations. LPS derived from Escherichia coli O55:B5 was purchased from Sigma (St. Louis, MO) (16). Synthetic E. coli-type lipid A (compound 506) was purchased from Dai-ichi Pure Chemicals (Tokyo, Japan) (16). Phosphorothioate-stabilized oligodeoxynucleotides containing unmethylated CpG motifs were purchased from TIB MOLBIOL (Berlin, Germany) (24). BM cells from femurs and tibias were plated at 1 × 106 cells/ml in 24-well plates with 10% FCS-RPMI 1640 supplemented with 10 ng/ml murine GM-CSF (PeproTech, London, U.K.) as described previously (25). At day 6, loosely adherent cells were harvested by gentle pipeting, plated at 5 × 105 cells/ml in 24-well plates, and cultured with or without 100 ng/ml LPS, 1 μg/ml synthetic lipid A, or 0.1 μM CpG DNA in a fresh medium for 2 more days. At day 8 of the DC culture, cell supernatants were harvested for measuring TNF-α and IL-12 p40 production by ELISA kits (Genzyme, Minneapolis, MN). DCs were incubated with anti-CD16/32 (2.4G2; BD PharMingen, San Diego, CA) to minimize nonspecific staining. They were then stained with biotinylated mAbs for 20 min at 4°C and developed with streptavidine-PE (BD PharMingen). The following biotinylated mAbs were also purchased from BD PharMingen: CD3 (145-2C11), CD11c (HL3), CD40 (3/23), CD80 (16-10A1), and CD86 (GL1). Flow cytometric analysis was performed using a FACSCalibur (BD Biosciences, Mountain View, CA) with CellQuest software (BD Biosciences). Unstimulated or stimulated BM DCs were harvested at day 8, washed, irradiated at a dose of 30 Gy, and plated at 3-fold serial dilutions in 96-well round-bottom plates. These stimulator DCs were incubated for 3 days with 5 × 104/well of splenic CD4+ T cells, which were isolated by using MACS with CD4 microbeads (Miltenyi Biotec, Bergisch Gladbach, Germany). The resulting population of CD4+ T cells after MACS was >95% positive for CD4, as determined by flow cytometry. [3H]Thymidine was added for the last 15 h.
Unstimulated or LPS-stimulated BM DCs were generated from wild-type BALB/c or MyD88-deficient mice with a BALB/c background. The DCs at day 8 were irradiated and cocultured with CD4+ T cells from DO11.10 TCR-transgenic mice (23) in the presence of 1 μM of chicken OVA peptide (residues 323–339) for 3 days. [3H]Thymidine was added for the last 15 h.
At day 6 of the DC culture, harvested cells were stimulated with 100 ng/ml LPS for indicated periods, lysed, and immunoprecipitated with anti-IL-1R-associated kinase (IRAK) Ab or rabbit anti-c-Jun N-terminal kinase (JNK)1 Ab (Santa Cruz Biotechnology, Santa Cruz, CA). The in vitro kinase assay and EMSA were performed as described previously (16). LPS (200 ng/head) derived from E. coli O55:B5 was i.v. injected into wild-type, TLR4-deficient, and MyD88-deficient mice. Control mice were injected with PBS. Six hours later, spleens were dissected and incubated with RPMI 1640 medium containing 400 U/ml collagenase (Wako, Osaka, Japan) and 15 μg/ml DNase I (Sigma) for 20 min at 37°C. For the last 5 min of the incubation period, 5 mM EDTA was added. Single-cell suspensions were prepared and stained with biotinylated anti-CD11c followed by streptavidin-PE and FITC-conjugated anti-CD40 or anti-CD86 (BD PharMingen). Stained cells were subjected to flow cytometric analysis. To assess the effects of LPS on DCs, immature DCs were generated in vitro by culturing BM cells with GM-CSF. First, we measured proinflammatory cytokine production in response to LPS. When wild-type immature BM DCs were stimulated with LPS, they produced more amounts of TNF-α and IL-12 p40 than those without LPS (Fig. 1⇓). 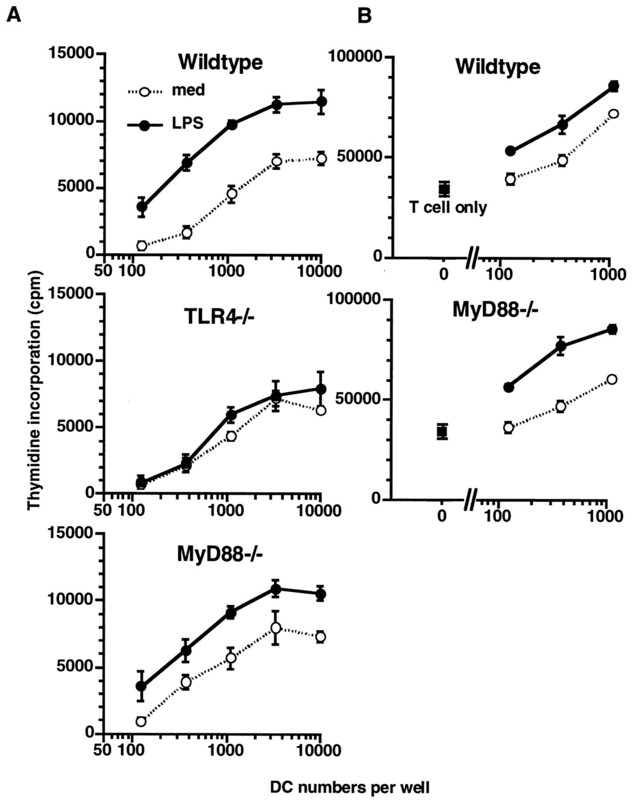 Meanwhile, the cytokine induction was abolished in TLR4- or MyD88-deficient BM DCs. The results suggest that LPS stimulates cytokine production in BM DCs through TLR4 in a MyD88-dependent manner. 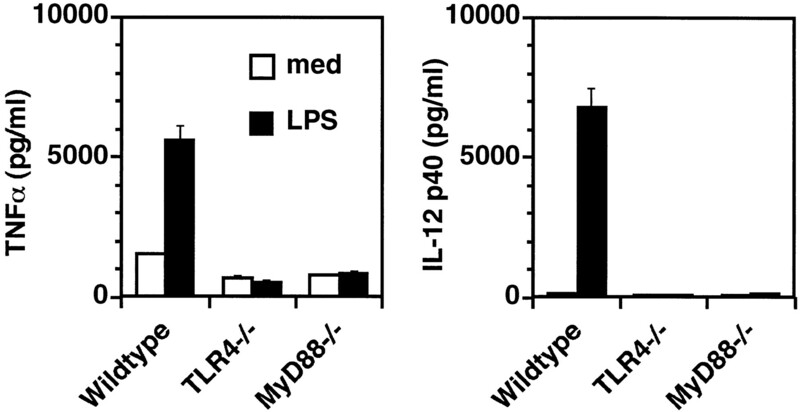 LPS-induced cytokine production in BM DCs is dependent on both TLR4 and MyD88. BM cells from wild-type, TLR4-deficient, or MyD88-deficient mice were cultured with GM-CSF. At day 6, cells were incubated with (▪) or without (□) 100 ng/ml LPS for 2 more days. Amounts of TNF-α and IL-12 p40 in the cell culture supernatants were measured by ELISA. The data indicate means ± SD of triplicate samples of one representative experiment. Next, we analyzed surface expression of costimulatory molecules on LPS-stimulated and unstimulated BM DCs. LPS could enhance surface expression of CD40, CD80, and CD86 in wild-type BM DCs (Fig. 2⇓). Meanwhile, CD11c expression was significantly decreased in response to LPS. This phenotype typically represents DC maturation (21). TLR4-deficient BM DCs showed no modulation of these surface molecules in response to LPS. However, upon LPS stimulation, MyD88-deficient DCs showed up-regulation of CD40, CD80, and CD86 and down-regulation of CD11c (Fig. 2⇓). These results clearly indicate that LPS-induced DC maturation is dependent on TLR4 but can proceed in the absence of MyD88. 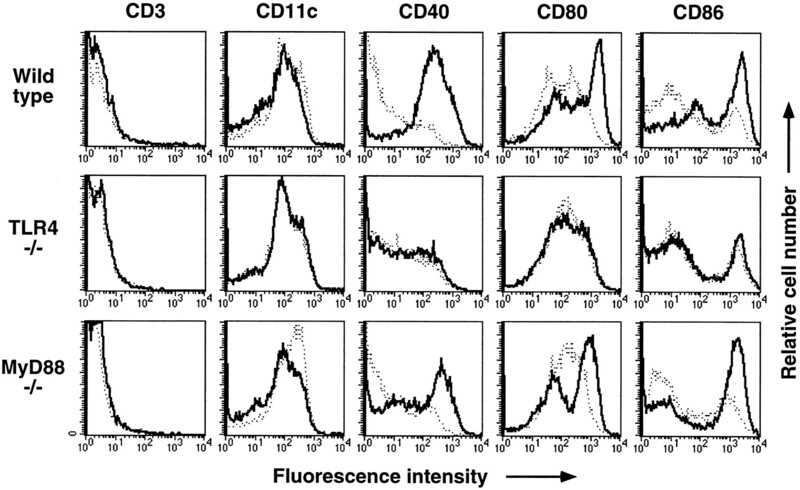 Flow cytometric analysis of LPS-stimulated and unstimulated BM DCs. At day 6 of the DC culture, cells were harvested and cultured with (solid lines) or without (dotted lines) LPS for another 48 h. Then cells were stained with biotinylated mAbs followed by PE-conjugated streptavidin and analyzed with FACS. Another hallmark of DC maturation is an increased capacity for T cell stimulation. To analyze allostimulatory activity of BM DCs, wild-type, TLR4-deficient, and MyD88-deficient BM DCs (H-2b) were irradiated and cocultured with allogeneic BALB/c CD4+ T cells (H-2d). Wild-type BM DCs showed augmented ability to stimulate allogeneic T cells in response to LPS (Fig. 3⇓A). Similarly, the allostimulatory activity of MyD88-deficient BM DCs was also enhanced with LPS stimulation. However, LPS did not enhance the ability of TLR4-deficient BM DCs to stimulate allogeneic T cells. Next, we investigated whether LPS could enhance APC activity of BM DCs. BM DCs from wild-type or MyD88-deficient mice were irradiated and cocultured with CD4+ T cells from cOVA-specific TCR-transgenic mice (23) in the presence of cOVA peptide. Both wild-type and MyD88-deficient BM DCs without LPS stimulation could augment cOVA-specific T cell proliferation in a DC number-dependent manner (Fig. 3⇓B, ○). When stimulated with LPS, both BM DCs showed enhanced ability to stimulate T cell proliferation (Fig. 3⇓B, •). Taken together, LPS could not only modulate costimulatory molecule expression but also enhance the T cell stimulatory activity of MyD88-deficient BM DCs. Allostimulatory and APC activity of BM DCs. A, To measure the allostimulatory activity of DCs, LPS-stimulated (•) or unstimulated (○) DCs (H-2b) were irradiated and incubated with allogeneic BALB/c CD4+ T cells (H-2d) at various cell concentrations as indicated. B, To measure the APC activity of DCs, LPS-stimulated (•) or unstimulated (○) DCs were irradiated and incubated at 1 μM of a cOVA peptide (residues 323–339) with CD4+ T cells derived from DO11.10 TCR-transgenic mice. The data from the culture containing T cells and a cOVA peptide without DCs are also shown (▪). T cell responses were evaluated by [3H]thymidine incorporation of CD4+ T cells. The data indicate means ± SD of triplicate samples of one representative experiment. To exclude the possibility that some contaminants were responsible for these LPS effects, we also tested the effects of synthetic lipid A, a biologically active moiety of LPS, in a similar set of experiments. As shown in Fig. 4⇓A, lipid A-induced cytokine production was dependent on MyD88. However, lipid A could significantly enhance not only CD40 expression but also allostimulatory activity of MyD88-deficient BM DCs (Fig. 4⇓, B and C). All of these effects were dependent on TLR4, because lipid A showed no effects on TLR4-deficient BM DCs. 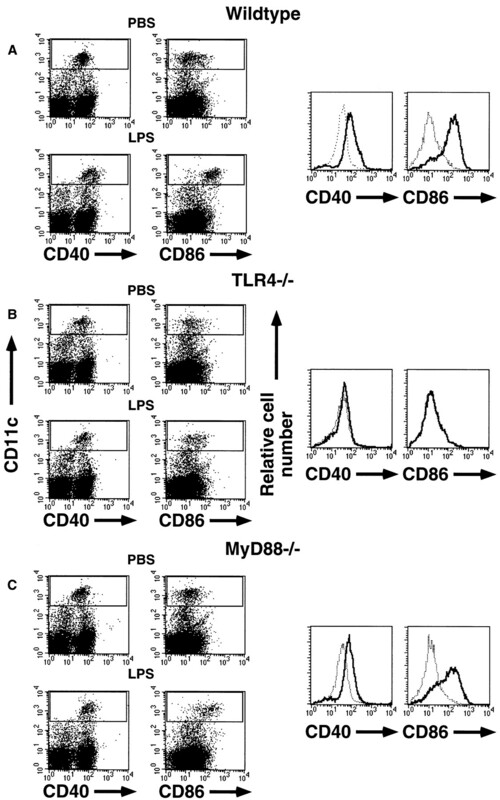 Lipid A can enhance CD40 expression and allostimulatory activity of MyD88-deficient BM DCs. At day 6 of the DC culture, cells were harvested and incubated with or without 1 μg/ml of lipid A for 2 more days. Cytokine production (A), CD40 expression (B), and allostimulatory activity (C) of BM DCs were analyzed as described in the legends of Figs. 1–3⇑⇑⇑. Bacteria-derived DNA containing CpG motifs can also induce cytokine production and DC maturation through another TLR family member, TLR9 (24). CpG DNA-induced cytokine induction from macrophages and DCs is dependent on MyD88 (26, 27). Therefore, we tested the effects of CpG DNA on wild-type and MyD88-deficient DCs. CpG DNA could induce cytokine production, surface expression of costimulatory molecules such as CD40, CD80, and CD86, and allostimulatory activity of wild-type DCs (Fig. 5⇓ and data not shown). However, all of these effects were abolished in not only TLR9-deficient (24) but also in MyD88-deficient DCs (Fig. 5⇓). The results clearly suggest that TLR9-mediated signaling can induce DC maturation in a MyD88-dependent manner. CpG DNA-induced cytokine production and maturation of BM DCs are dependent on MyD88. At day 6 of the DC culture, cells were harvested and incubated with or without 0.1 μM CpG DNA for 2 more days. Cytokine production (A), CD40 expression (B), and allostimulatory activity (C) of BM DCs were analyzed as described in the legends of Figs. 1–3⇑⇑⇑. Mice of the C3H/HeJ strain show defective responses to LPS and were found to carry the point mutation in the Tlr4 gene locus, which results in the replacement of a conserved proline residue with a histidine residue in the cytoplasmic region of TLR4 (6, 7). This point mutation is responsible for diminished responses to LPS (8). We have investigated whether C3H/HeJ DCs can mature in response to LPS. LPS-induced cytokine production was severely impaired in C3H/HeJ DCs as in TLR4- and MyD88-deficient DCs (Fig. 1⇑ and 6⇓A). Unlike MyD88-deficient DCs, C3H/HeJ DCs did not show either up-regulation of CD40, CD80, and CD86, nor down-regulation of CD11c in response to LPS (Fig. 6⇓B and data not shown). C3H/HeJ DCs also showed severe impairment of LPS-induced allostimulatory activity (Fig. 6⇓C). Taken together, LPS could induce neither cytokine induction nor DC maturation in C3H/HeJ DCs. 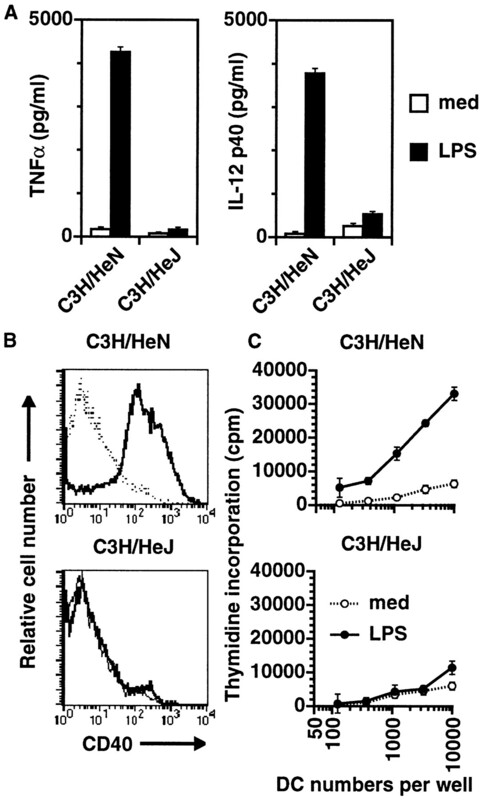 Impairment of both cytokine induction and maturation of C3H/HeJ DCs in response to LPS. At day 6 of the DC culture, cells were harvested incubated with or without 100 ng/ml LPS for 2 more days. Cytokine production (A) and CD40 expression (B) were analyzed as described in the legends of Figs. 1⇑ and 2⇑. C, Allostimulatory activity of LPS-stimulated (•) or unstimulated (○) C3H/HeN or C3H/HeJ BM DCs (H-2k) were evaluated by coculture with allogeneic BALB/c CD4+ T cells (H-2d). We next examined the LPS signaling pathways of wild-type and mutant DCs. MyD88 interacts with TLR4 through a TIR domain and recruits IRAK to the receptor complex through a death domain, and then IRAK is sequentially activated (14, 15). LPS could not induce IRAK activation in either TLR4- or MyD88-deficient DCs, indicating that MyD88 is essential for LPS-induced IRAK activation (Fig. 7⇓A). Activated IRAK subsequently activates NF-κB via TNFR-associated factor (TRAF)6 (14, 15). Next, LPS-induced NF-κB activation in DCs was examined by EMSA (Fig. 7⇓B). NF-κB DNA binding activity was detected in wild-type DC nuclear extracts at 10 min after LPS stimulation and gradually increased thereafter (Fig. 7⇓B). This NF-κB activation is dependent on TLR4, because it was not observed in TLR4-deficient DCs. NF-κB activation was detected at 60 min after LPS stimulation in MyD88-deficient DCs in a similar level to that observed in wild-type DCs. However, kinetics of NF-κB activation showed delayed induction in MyD88-deficient DCs as compared with that in wildtype DCs. Furthermore, LPS-induced JNK activation, which is dependent on TLR4, was also detected in MyD88-deficient DCs with delayed kinetics (Fig. 7⇓C). Meanwhile, LPS-induced activation of IRAK, NF-κB, and JNK was abolished in both TLR4-deficient and C3H/HeJ DCs (Fig. 7⇓). The results show a close correlation of NF-κB and JNK activation with DC maturation in response to LPS and strongly suggest that residual biochemical responses in MyD88-deficient DCs are involved in LPS-induced DC maturation. Analysis of LPS signaling pathways in BM DCs. BM DCs were stimulated for indicated periods with 100 ng/ml LPS and analyzed for (A) IRAK, (B) NF-κB, or (C) JNK activation. The cell lysates were immunoprecipitated with anti-IRAK or anti-JNK1 Abs and measured for their kinase activities by in vitro kinase assay (A and C, upper panels). For IRAK kinase activity, autophosphorylating activity was measured (KA). For JNK kinase activity, GST-c-jun was used as substrate. The same lysates were also blotted with anti-IRAK or anti-JNK1 Ab (A and C, lower panels). B, LPS-induced NF-κB activation in BM DCs was analyzed as described previously (16 ). Experiments were independently performed three times with similar results. We next investigated in vivo effects of LPS on splenic DCs from wild-type and mutant mice. Intravenous injection of LPS can induce up-regulation of costimulatory molecule expression on splenic DCs (28). Splenic CD11c+ cells from LPS-injected wild-type mice showed increased expression of CD40 and CD86 compared with those from PBS-injected wild-type mice (Fig. 8⇓A). LPS-induced up-regulation of costimulatory molecules was abolished in TLR4-deficient mice (Fig. 8⇓B). However, in MyD88-deficient mice, splenic DCs significantly increased their surface expression levels of CD40 and CD86 in response to LPS injection (Fig. 8⇓C). Serum IL-12 p40 levels reached 718 ± 27 pg/ml in LPS-injected wild-type mice, whereas levels were <10 pg/ml not only in PBS-injected wild-type mice, but also in LPS-injected TLR4- and MyD88-deficient mice. Thus, these in vivo experiments clearly indicate that LPS can induce up-regulation of costimulatory molecules on splenic DCs in a TLR4-dependent and MyD88-independent manner. In vivo effects of LPS on splenic DCs. LPS was injected i.v. 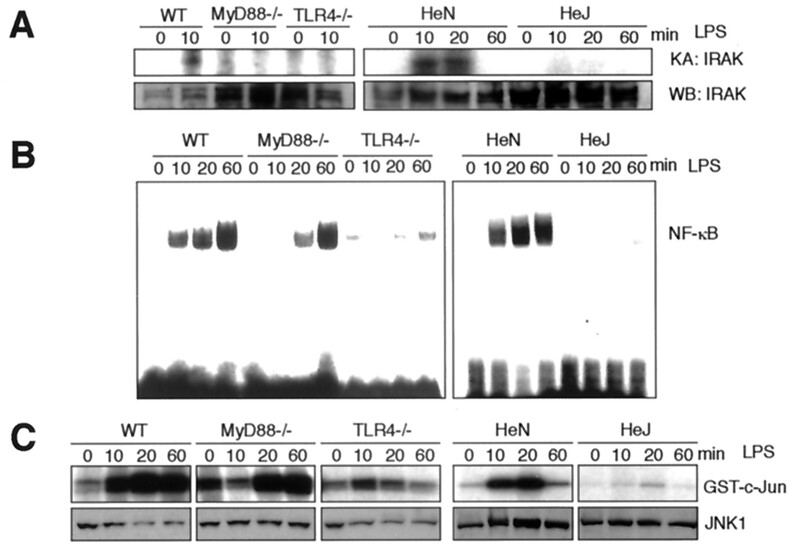 into (A) wild-type, (B) TLR4-, and (C) MyD88-deficient mice. Six hours later, splenic cells were analyzed for their CD40 vs CD11c or CD86 vs CD11c profiles. CD11c+ cells were gated, as shown by the rectangles, and their histograms are also shown. Solid and dotted lines in the histograms represent the data from LPS- and PBS-injected mice, respectively. Experiments were independently performed three times with similar results. It has thus far been assumed that MyD88 is essential for all biological effects through LPS signaling (16, 29). This assumption is mainly based on the experiments studying macrophages and B cells. The present study clearly demonstrates that LPS can induce functional DC maturation in a MyD88-independent manner. DC maturation was verified by the facts that LPS could enhance not only surface expression of costimulatory molecules but also T cell stimulatory capacity, such as allostimulatory and APC activity in MyD88-deficient BM DCs. Furthermore, splenic DCs from both wild-type and MyD88-deficient, but not TLR4-deficient, mice enhanced their expression levels of costimulatory molecules in response to LPS injection. The results clearly indicate that the MyD88-independent pathway can lead to maturation of not only in vitro BM DCs, but also in vivo DCs. Expression levels of costimulatory molecules and T cell activating ability on LPS-stimulated MyD88-deficient DCs were not as high as those observed on LPS-stimulated wild-type DCs (Figs. 2⇑ and 3⇑). However, different from no responses to LPS in TLR4-deficient as well as C3H/HeJ DCs, MyD88-deficient DCs consistently showed significant enhancement of these activities in response to LPS (Figs. 2⇑, 3⇑, and 6⇑). In contrast, LPS could not stimulate production from MyD88-deficient BM DCs, which is consistent with our previous study about MyD88-deficient macrophages (16). Like MyD88-deficient macrophages, both NF-κB and JNK were activated with delayed kinetics in MyD88-deficient BM DCs, although IRAK activation was abolished. Commercial preparations of LPS are often contaminated with some TLR2 agonist (30). However, it is unlikely that some contaminants contribute to MyD88-independent DC maturation. First, we used LPS derived from E. coli serotype O55:B5, which is phenol-extracted and then chromatographically purified by gel filtration (16). The effects of this LPS on MyD88-deficient BM DCs were completely abolished by addition of polymyxin B (data not shown). Furthermore, we have also used synthetic E. coli-type lipid A (compound 506) in our culture system. The lipid A could induce CD40 up-regulation and enhancement of allostimulatory activity on both wild-type and MyD88-deficient BM DCs (Fig. 4⇑). Therefore, we can exclude the possibility that LPS-induced maturation is due to some contaminants in the LPS preparation. It is also noteworthy that, in contrast to TLR4 signaling, TLR2 signaling can induce activation of NF-κB and MAPK cascades in a MyD88-dependent manner (31). Together with the fact that DC maturation observed in this study is dependent on TLR4, these results clearly indicate that the MyD88-independent pathway is located downstream of TLR4. Neither TLR4-deficient nor C3H/HeJ DCs showed any responses to LPS. This indicates that the conserved proline residue in the cytoplasmic region of TLR4 is essential for both cytokine induction and DC maturation signals and that LPS-induced, MyD88-dependent and independent pathways originate at the TLR4 cytoplasmic region. Because IRAK activation is dependent on MyD88 (16 and Fig. 7⇑A), it is integrated in the MyD88-dependent pathway. In this context, it should be noted that LPS can induce activation of NF-κB and MAPK cascades with delayed kinetics in IRAK-deficient macrophages (32). Furthermore, delayed activation of NF-κB in response to LPS was also observed in TRAF6-deficient embryonic fibroblasts (data not shown). Taken together, it can be reasonably assumed that sequential activation of MyD88, IRAK, and TRAF6 is involved in MyD88-dependent pathway. Meanwhile, such sequential activation does not seem to be involved in the MyD88-independent pathway, although both pathways can lead to NF-κB activation. With serine protease inhibitors such as N-tosyl-l-phenylalanine chloromethyl ketone or N-α-p-tosyl-l-lysine chloromethyl ketone, Rescigno et al. argued that LPS-induced DC maturation assesed by up-regulation of costimulatory molecules such as MHC and CD86 is dependent on NF-κB activation (33). We have also found that N-tosyl-l-phenylalanine chloromethyl ketone and N-α-p-tosyl-l-lysine chloromethyl ketone could decrease the up-regulation of surface CD40 expression in response to LPS in both wild-type and MyD88-deficient BM DCs (our unpublished data). However, although the reagents can block nuclear translocation of NF-κB by preventing of the inhibitor of κB (IκB)-α degradation (34), it is unclear at present whether they affect other signaling cascades. Thus, further studies are necessary to clarify whether NF-κB activation is essential for LPS-induced DC maturation. The receptor for bacterial DNA, TLR9, possesses the conserved proline in the cytoplasmic region and shows a similar overall molecular structure to TLR4. However, signaling through TLR4 is significantly distinct from that through TLR9, in the respect that the former can activate the MyD88-independent pathway, leading to NF-κB activation. At present, the molecular mechanism of this pathway remains to be clarified. In Drosophila, Tube functions as an adaptor protein in Toll-signaling and is considered to be a homologue of MyD88. However, Drosophila genome sequencing identified the homologue of mammalian MyD88 (DDBJ/GenBank/EMBL accession number AAF58953). Drosophila MyD88 carries the TIR and death domain-like mammalian MyD88, whereas Tube does not carry a TIR domain. It is an interesting possibility that a mammalian homologue of Tube functions as an adaptor for the TLR family. A future challenge will be the identification and characterization of signaling molecules involved in the MyD88-independent pathway. We thank N. Iwami for excellent technical assistance and Dr. T. Yasui for helpful discussion. We are also grateful to Dr. K. M. Murphy, Dr. T. Yoshimoto, and Hayashibara Biochemical Laboratories for providing us with DO11.10 mice, a chicken OVA peptide, and anti-IRAK Ab, respectively. ↵1 This work was supported in part by grants from the Ministry of Education, Culture, Sports, Science, and Technology in Japan, Novartis Foundation (Japan) for the Promotion of Science, Kato Memorial Bioscience Foundation, Kowa Life Science Foundation, and Core Research for Evolutional Science and Technology of Japan Science and Technology Corporation. 3 Abbreviations used in this paper: TLR, Toll-like receptor; MAPK, mitogen-activated protein kinase; DC, dendritic cell; TIR, Toll/IL-1R homology; BM, bone marrow; IRAK, IL-1R-associated kinase; TRAF, TNFR-associated factor; JNK, c-Jun N-terminal kinase.